The architecture of small villages in the Russian North gives some indication as to what life might have been like for residents in the last 19th and early 20th centuries. In the vast expanses of the Russian North, rivers were historically the essential arteries of communication between communities set within dense forests and surrounded by marshlands. Today these rivers are no longer actively used for transportation and the population along them is declining, but the rivers still lead to once-viable settlements where remnants of traditional design and crafts have survived, often to remarkable effect. One such river is the Vaga, the main left tributary of the Northern Dvina. More than 350 miles long, the Vaga flows northward from Vologda Province to Arkhangelsk Province, and enters the Dvina at the small town of Shenkursk. Its upper reaches are fed by a web of streams and small rivers. This aquatic network is nestled among gentle, rolling hills that form some of the most picturesque landscapes in the north. The center of the upper Vaga region is the town of Verkhovazhye (population 5,000), located in the northernmost part of Vologda Province. Its name, not surprisingly, means "upper Vaga." First mentioned in the early 17th century, the settlement struggled for existence in its remote location. To get to Verkhovazhye take the regular train from Moscow to Vologda and than take the local bus to Verkhovazhye (departure from Vologda bus station: 8:20 a.m, 4:55 p.m., travel time 4:45). Later, in the 18th century, the position of Verkhovazhye improved with the development of the Vologda-Arkhangelsk post road, which skirted the settlement to the north. A symbol of its status was the brick Cathedral of the Dormition of the Virgin, begun in 1755 to replace a wooden church. Completed 10 years later, the Dormition Cathedral was expanded in the mid-1770s with a western extension that could be heated for worship during the winter. During the 19th century, a few imposing brick buildings were erected in the neoclassical style, but the small town was built largely of wood. At that time, it was widely known for its annual St. Aleksii Fair, which attracted hundreds of merchants and peasants. In the summer of 1858, Tsar Alexander II passed through Verkhovazhye as part of his tour of the Russian north. A devastating fire in 1879 reduced much of Verkhovazhye to ruins, and it never regained the active market life of the mid-19th century. Nonetheless, a gradual rebuilding resulted in a number of appealing wooden houses that exist to this day – including a 2-story structure that houses an interesting local history museum. During the late 1930s, what remained of the Dormition Cathedral was closed, vandalized and used for secular purposes, including a club and a gym. Its cupolas were destroyed, and over the next half century, its interior art vanished. Fortunately, plans to raze the church were not implemented and during the 1990s it was reconsecrated for worship. Today, Verkhovazhe continues its sleepy existence as a modest administrative center in the Vologda hinterlands. The nearest rail station is at Velsk, 25 miles to the north. Improvement of the Moscow-Arkhangelsk highway (M-8) in the late 1980s led to an increase in highway traffic and a modest boost to the local economy. Those interested in traditional Russian art will find obscure treasures in villages scattered throughout the Verkhovazhye region and the adjacent Velsk region, to the north in Arkhangelsk Region. The area has its brick churches, a few of which have been partially restored. Notable examples include the Church of the Epiphany in Pezhma (1806) and the early 19th-century Church of the Resurrection at Smetanino. But the traditional culture of the upper Vaga region is most distinctively expressed in wooden houses and churches. Some of the houses are in perilous state, located in villages that have been nearly abandoned. Nonetheless, there are surviving houses with unique decorative paintings on both exterior and interior. A good example is a rambling log dwelling in the hamlet of Ostrovskaya. Particularly notable here is the lion motif, symbolizing power and yet delightfully playful in this folk painting. In rare cases some of the house interiors still preserved chromolithograph posters from the early 20th century. The pervasive presence of painting in this environment is also evident in the remains of wooden chapels that dot the landscape near villages such as Fedkovo, Nikiforovo, Selivanovo and Seredniaia. Abandoned and weathered by the elements, these lyrical remnants of folk culture still have fragments of paintings and decorative art within them. Of equal interest are the area’s wooden churches, such as the large Church of the Resurrection at Kozlovskoe, built in 1791 near the Kokshenga River just north of the border between Volodga and Arkhangelsk Provinces. In a recent restoration, the plank siding of the church has regained its white color. These capacious houses of worship show a more expansive sense of space than the traditional log churches of an earlier period, with their dramatic tower forms. 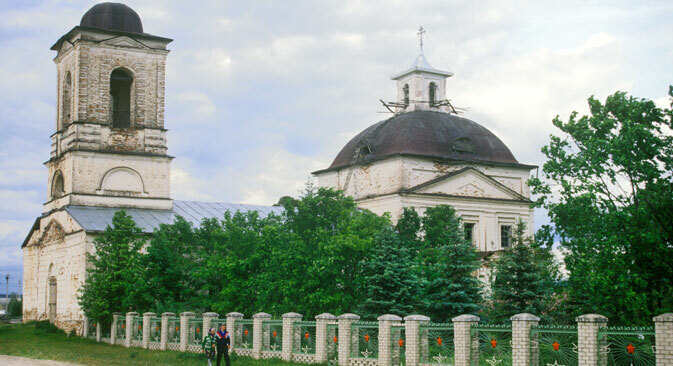 The increased size and simpler forms of churches such as the one at Kozlovskoe suggest a wide and active participation in religious observances in large northern villages. This is a little studied aspect of Russian spiritual life before the cataclysms of the 20th century. Although the time that created these wooden buildings is long past, they continue to nourish the soul in the evocative and beautiful landscape along the upper reaches of the Vaga River.